Below is a complete list of programs developed and distributed by PC-Progress. This list does not include several large FEM programs developed in collaboration with our business partners. HYDRUS (2D/3D) - software package for simulating water, heat, and solute movement in two- and three-dimensional variably saturated media. The software package consists of a computational computer program and an interactive graphics-based user interface. A brief description of HYDRUS is given in the Introduction and Program Description. More detailed information is given in the Technical and User Manuals of HYDRUS. Hydrus-2D & Meshgen-2D - previous two-dimensional version of HYDRUS, which was distributed from 1997 to 2005. In March 2006 this software was replaced by new HYDRUS 2D/3D. These programs have been developed and maintained in cooperation with University of California, Riverside, USA. Hydrus-1D - Windows-based modeling environment for analysis of water flow and solute transport in variably saturated porous media. The software package includes the one-dimensional finite element model HYDRUS for simulating the movement of water, heat, and multiple solutes in variably saturated media. The model is supported by an interactive graphics-based interface for data-preprocessing, discretization of the soil profile, and graphic presentation of the results. STANMOD - (STudio of ANalytical MODels) is a Windows-based computer software package for evaluating solute transport in porous media using analytical solutions of the convection-dispersion solute transport equation. RETC - computer program which may be used to analyze the soil water retention and hydraulic conductivity functions of unsaturated soils. These hydraulic properties are key parameters in any quantitative description of water flow into and through the unsaturated zone of soils. DISC - computer software for analyzing tension disc infiltrometer data by parameter estimation. Download program (10.6Mb) or manual (0.4 MB). DREAM Suite - software package for Bayesian inference of numerical simulation models. The program has been developed in cooperation with Dr. Jasper Vrugt and can be used for the rapid development of applications based on the theory of Markov chain Monte Carlo (MCMC) simulation. 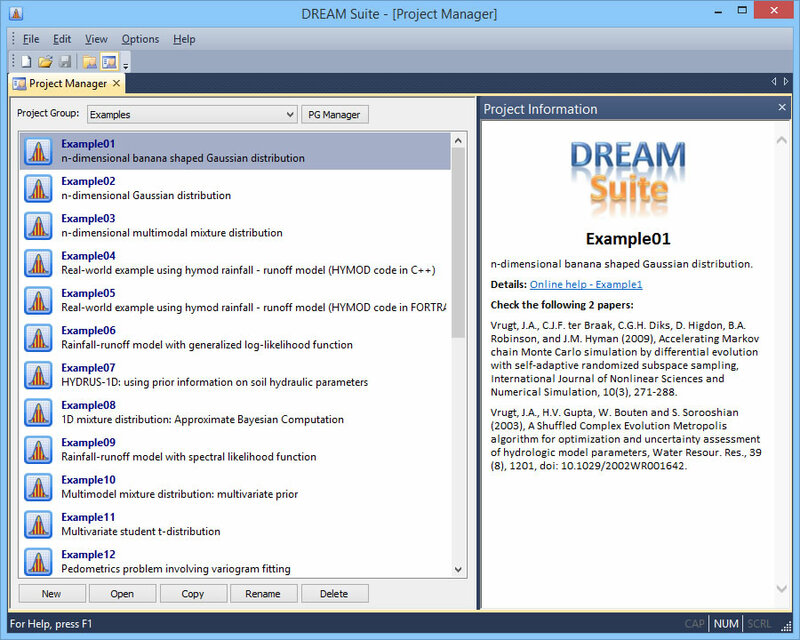 The package includes more than twenty different examples illustrating the main capabilities and functionalities of DREAM Suite. MESHGEN Plus - open modeling environment for Finite-Element and Finite-Volume applications. Includes 2D/3D geometry modeler, FE-mesh generator, and customizable modules for pre- and post-processing. This package allows rapid development of FEM-based applications and integration with various clients’ modules (solvers, etc.). COCHEM Flow - Windows application for simulations of two-dimensional transonic compressible flow. The numerical model also allows calculations of two-phase wet-steam flow with homogeneous and heterogeneous condensation in the presence of chemical impurities dissolved in steam.